Note that if you want the sound to play automatically and the sound is a WAV file, it’s easier to add it to the slide transition than to add it as a separate object. Move to the slide to which you want to add the sound. Open the Insert tab on the Ribbon, click the Audio button located on the right side of the tab, and then choose Audio on My PC. The Insert Audio dialog box appears, as shown here. The Insert Audio dialog box. 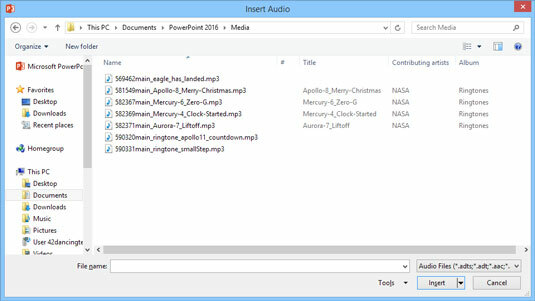 Select the audio file that you want to insert. You may have to rummage about your hard drive to find the folder that contains your sound files. The audio file is inserted into the current slide, along with a toolbar of controls that let you play the sound. A sound inserted onto a slide. You can also insert sounds from the Internet. To do so, click the Audio button on the Insert task pane tab and then choose Online Audio. Then, you can search for the sound you want to insert. 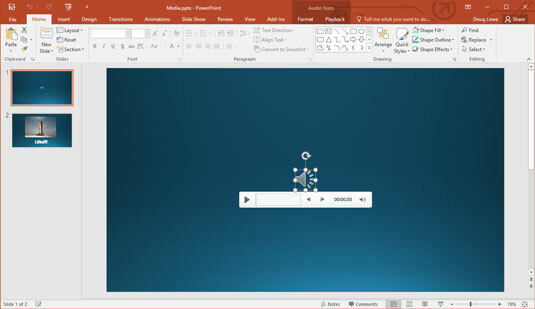 To play a sound while working in Normal View, double-click the sound icon. However, to play the sound during a slide show, click only once. Remember that you can also play audio files as a part of the slide transition. If you change your mind and decide that you don’t want any sounds, you can easily remove them. To remove a sound, click the sound’s icon (which resembles a speaker) and press Delete.